A stunning contemporary-chic wedding held at The Corinthians Resort and Club, Pune is giving is all we are talking about today! Komal and Ronak had a three day celebration filled with excellent décor details, magnificent outfits and a whole lotta love. The Corinthians Resort and Club, Pune played perfect host to their modern wedding still not forgetting the traditional elements that are all to dear a part of Indian marriages and the celebrations that follow. 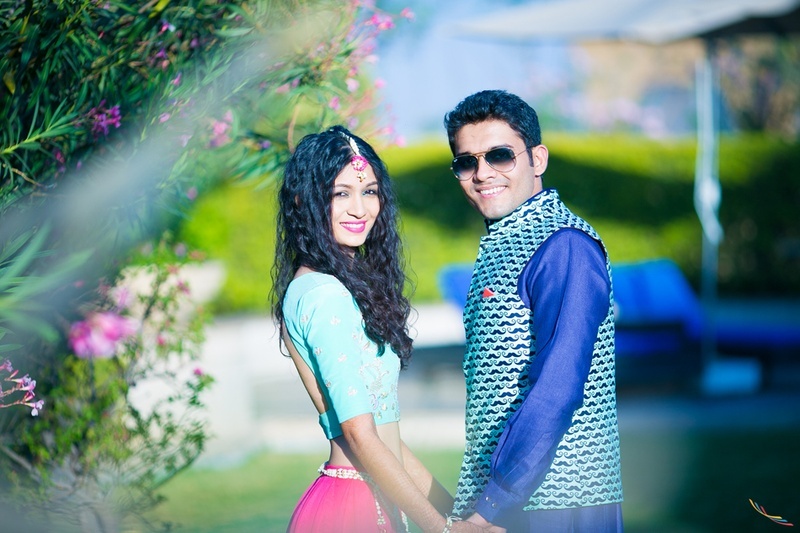 Right from the kitschy mehndi ceremony up until the wedding where this bride donned a stunning Samant Chauhan lehenga – every component of this uber stylish affair held at The Corinthians Resort and Club, Pune was done beautifully. Shot brilliantly by Colorblast – Amit who captured Komal and Ronak’s wedding in all its magnificence. Scroll down to see! Pin wheels, triangular flags, kitschy yellow boxes and a bride who knows how to style it up! Komal wore a chic mehndi lehenga – one like we’ve never seen before! A short skirt with a sheer overlay in bright fuchsia – Komal did it in style! Throw in a floral maangtikka and waistbelt with the aqua half-sleeved blouse and you have bridal wear goals right here! Her dapper groom, Ronak’s moustache printed Nehru jacket too was oh-so-pinterest worthy. An Arabian nights themed Sangeet took place in a blue-hued indoor space with delicate décor details. Blue and gold drapes complemented with tiny lamps, tea lights and that golden magical lamp? Sweet details like these always seem to steal our hearts. The cupcakes and cushion along with that magical cake was the perfect for bringing in the contemporary-chic element at this blue-hued sangeet ceremony. Ronak stunned in a deep red bandhgala jacket with gold detailing while Komal donned a stylish gold and green lehenga – choli from LTD Addition. The jacket styled blouse paired with that gorgeously flared gold lehenga was absolute magic! We couldn’t help but create this section for this stunning, stunning bride Komal. Her entire wedding ensemble was put together with great detail keeping in mind the theme of the wedding, her personal taste and what’s in vogue too – and it all spelled out perfectly! The gorgeously flared Samant Chauhan lehenga had intricately embroidered kalis in tones of bronze, blue and gold – seriously. Bloody. Gorgeous. That lehenga, paired with her stunning Amrapali jewellery – Komal as a bride, was a vision to behold! Gold chivaris with pretty pink tie-backs, delicate gold kalire as hanging décor, and a mandap filled with fuschia and pink carnations along with white drapes – Komal and Ronak’s wedding was all things chic and contemporary still not forgetting the traditional rituals that go along with it. The hanging yellow-hued lights perfectly complemented this gorg couple’s entire pink-white-gold wedding set up. But what especially caught our attention was their “So You’re Going To Sit Through The Wedding” card – pretty fun and perfect for guest engagement – don’t you think?